Well, let me not waste your time and get straight to the point. If you are looking for a low cost entry level adjustable bed, then be surprised to know about Naomi Home adjustable bed. Price-wise it carries the lowest price tag when compared to its contemporaries but feature-wise it has all mandatory features. Yes, you read it right, it has all the must have features of a mid-range adjustable bed including dual massage functionality, 2 USB ports, memory position and wireless remote control with 17 functions. Finally, the biggest surprise is it comes with bluetooth powered mobile app for both Android and Apple devices. Perhaps, this sums it up and just take a quick look at its price as well before moving further. The head section is adjustable all the way up to 70 degrees and feet the feet section up to 40 degrees. These angles are much higher than industry standards. Other adjustable beds in the price segment have relative less angular adjustments. 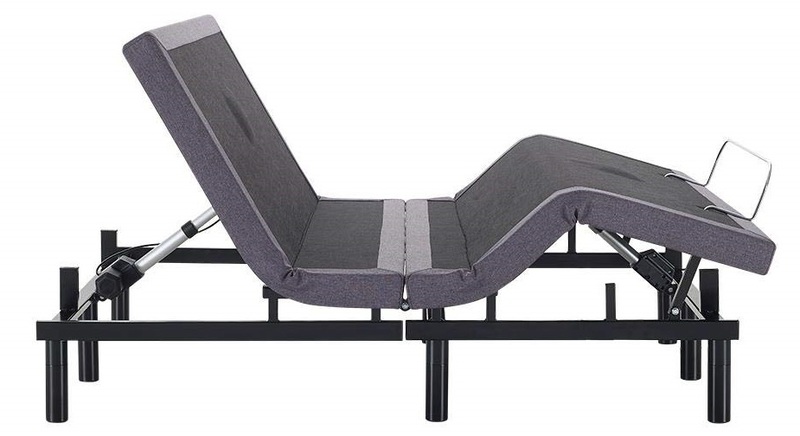 Naomi home adjustable bed is extremely sturdy and can sustain weights all the way up to 850 lbs while in flat position. Simply loved the remote control that comes with Naomi adjustable bed. Look-wise it is sleek and stylish and has 15 buttons embedded to manage 17 different functions. Additionally, if you opt for two twin beds then both the beds can be paired and operated from single remote control. And yet again, there are options to select which particular bed to operate post pairing both the beds. Apart from basic functions for adjusting head and feet sections, it supports following functions. It comes with 2 mandatory preset positions – Zero-gravity and FLAT. Naomi Home adjustable bed offers 1 memory savable position. Additionally, it allows you to customize the zero-gravity positions. Hence, you kind of have 2 memory savable positions. One you can tune to either lounge/TV/Reading position and also fine tune the zero-gravity position to best fit your exact height. The best part of Naomi adjustable bed is the massage functionality. It has separate motors for both head and feet sections. 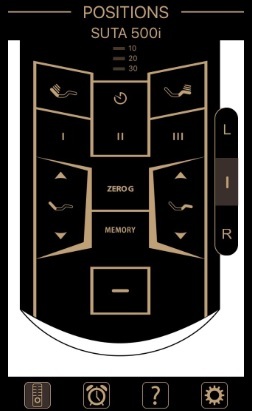 The remote allows you to opt for either head massage, feet massage or both. Dual massage motors work in tandem / alternatively and this give a pulse like massage running from head to toe. This is yet again an advanced feature available only in mid-range / high-end adjustable beds. It comes with 3 timers to choose from – 10 mins, 20 mins and 30 mins. As said in the intro, Naomi adjustable bed offers all mandatory features and one such feature is USB ports. Naomi offers 2 USB ports, one on each side of the bed. Hence, at least one USB port is definitely available for you to charge your devices even if you happen to place the bed next to a wall. Naomi home adjustable bed offers standard mattress retainer bar at the feet section. Retainer bars are known to perfectly hold mattresses in place unlike newly introduced mattress strips that might result in mattress slipping sideways while performing adjustments or when massage is running. It comes with 2 individual leg units, 6 inches and 3 inches height adjustable leg unit. As per the manual, the warranty terms say 20-Year overall warranty covering 1-Year full coverage and 2-5 Years on electronics and the rest of the period on structural issues. As mentioned in the very intro, there is, perhaps, no better choice than Naomi home adjustable bed especially at the quoted price. Above all, the biggest advantage is the mobile app for both Android and Apple devices. Till date, only super expensive high-end adjustable beds come with mobile apps. And Naomi adjustable bed offering mobile app in itself is its biggest USP.